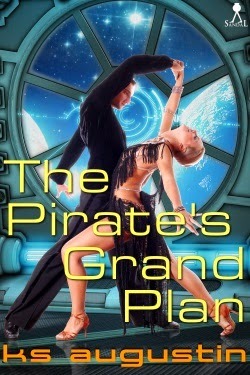 From August 1-10, 2014, author KS Augustin is running a free ebook special on two of her science fiction romances! 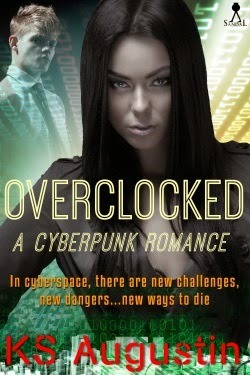 Her cyberpunk romance OVERCLOCKED (2012) and "future historical" THE PIRATE'S GRAND PLAN (2013) will be free for those using discount code “4ksaugustinreaders” on either Limited Run or Gumroad. The deduction will be made at checkout. In a new world, there are new challenges, new dangers…new ways to die. Carl Orin, Basement Five’s first cybernaut is lost in a universe of bits and bytes. His rival, Dr. Tania Flowers, should be happy that karma has bitten Carl in the backside, but she’s itching to get into cyberspace herself and what better excuse than a one-woman rescue mission? Tania thinks she’s prepared for what she’ll find, but she’s about to discover that the digital world is more dangerous than she imagined. When she finds Carl, she faces a bigger issue than her injured pride. An AI-fuelled botnet is devastating the digital landscape, and only a suicide mission into its core will avert total disaster. In the midst of their rekindled passion, hard decisions need to be made. Who will attempt the impossible? Who will stay behind? And what happens if either of them fails? This book will appeal to readers who like cyberpunk, a PoC main character, contemporary setting, and movies such as Tron and Matrix. Tera d’Olzon is a privileged member of Republic high society, trying to make a difference by thumbing her nose at everything her family stands for. Unfortunately, things haven’t quite turned out the way she anticipated and, while running from Security Forces, she is “rescued” by Gil’s cartel. For readers of historical romances, those who like PoC main characters, sarcastic heroines, space pirates and Pyg(malion) in spaaaacce!